Thankfully, it is a task I relish. 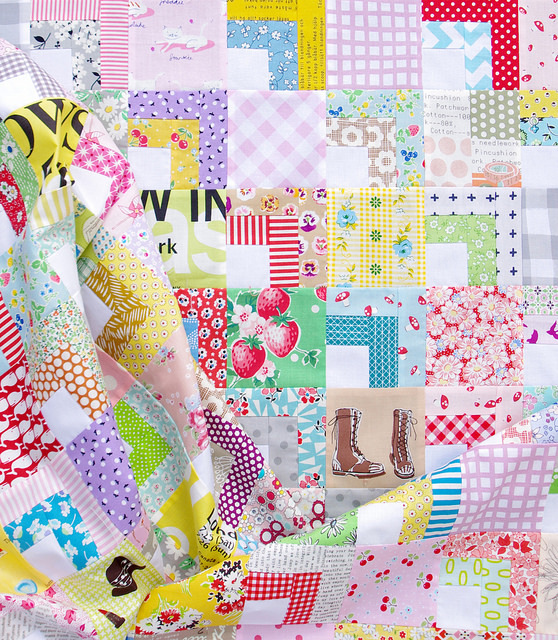 And scrap quilts are at the top of my list; in this instance by scrap quilt I mean a quilt made from many different fabrics to create an all over "scrappy" look, rather than fabrics that have been rescued from the scrap bin. 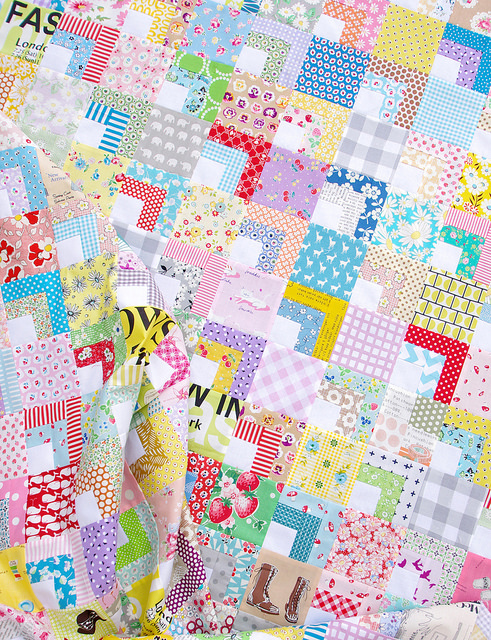 The fabrics used for this quilt are all from stash, and range from small scale 30's prints to modern large scale designs, Japanese imports, designer quilting cottons and stash basics (dots, checks, stripes etc), in all the colors of the rainbow and more. 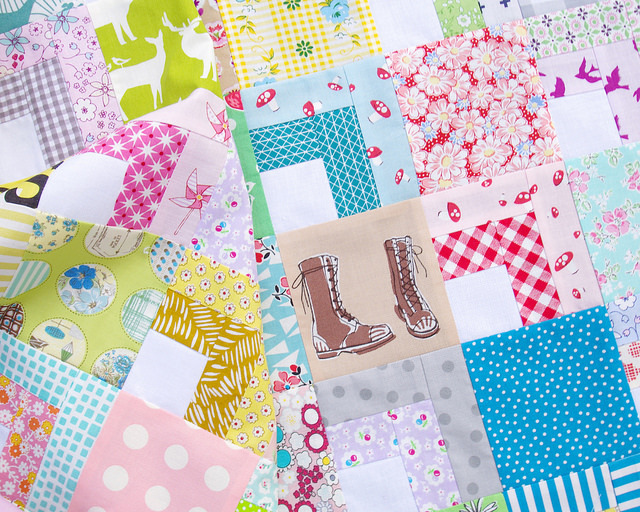 The quilt design is simple, alternating a patchwork square with a small quarter log cabin block. Lots of repetitive sewing. Cut, sew, press and repeat. This quilt is more about the fabrics than the design, although I do think that the little log cabins and the white "center" squares give the quilt a fresh, and modern look, as well as a sense of calm. Those touches of mauve are lovely and the white does make it fresh and modern. Whimsical. Love the little things you do-like fussy cut the boots fabric. Your work is always fabulous. I'd love to go through your fabrics one day... so fun! That boot print! Yes, a shot of your fabric stash would be a treat! Absolutely my kind of quilt. I discovered a long time ago that if there is significant amount of white in a quilt, then I am happy with it. Love the "sense of calm" ....! 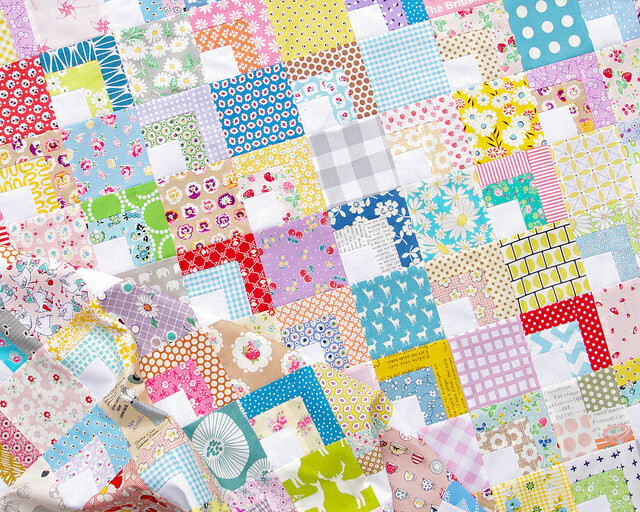 I love this and I have soooo many 3.5" squares left over 9really from the baby quilts. Great idea Rita ! 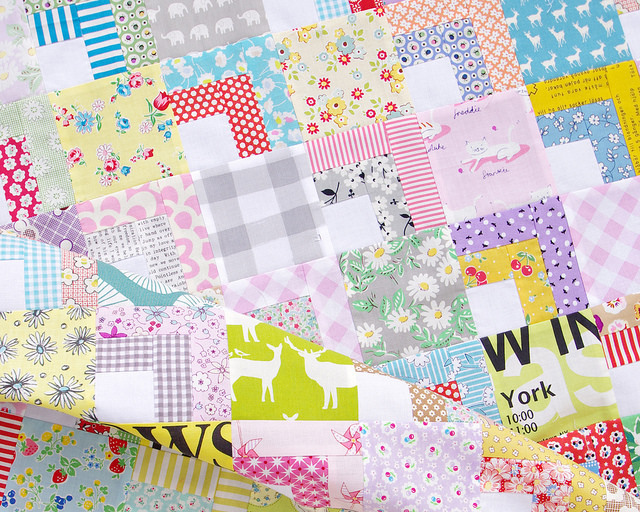 Love your fabrics and quarter log cabin! Stop hoarding, just use it. Make stuff with the fabric. I am trying very hard to cut into my stash, and use up as much as I can. 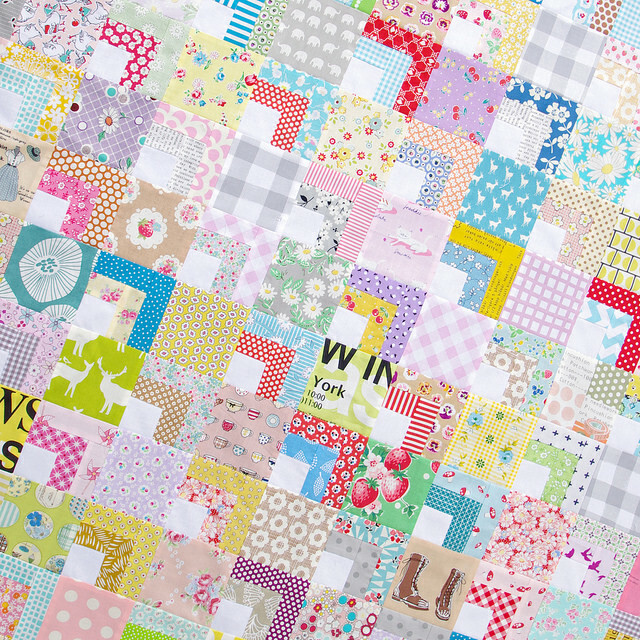 Your quilts are simple yet always look so complicated. 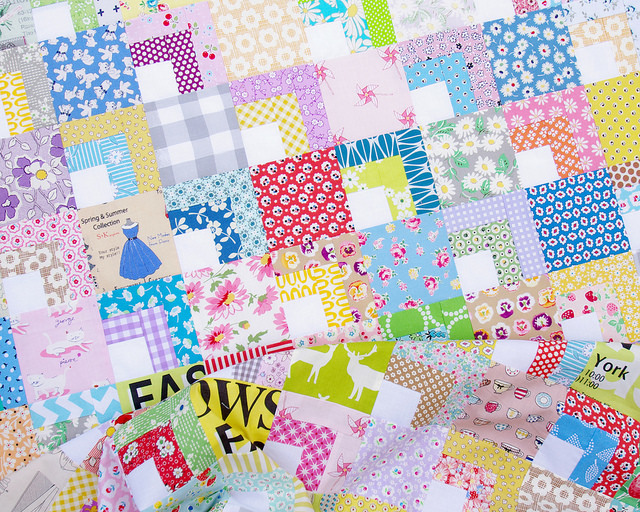 I don't have scraps but lots of precuts and FQ bundles. I have thought about how I can make a quilt in similar style but have no idea how. I guess just buying low volume quilt bundles would be a start. 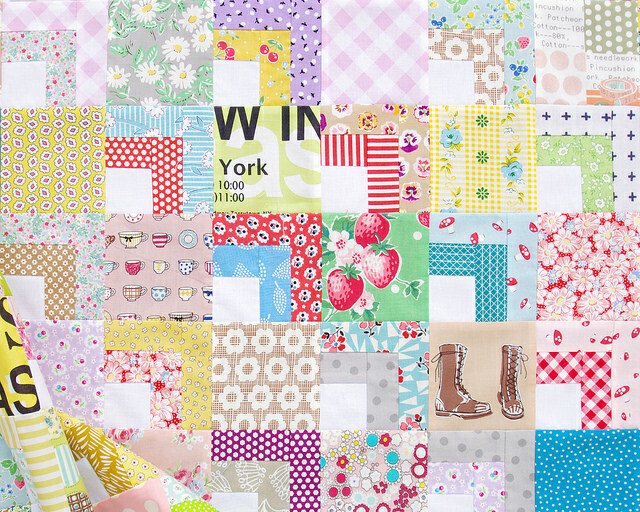 I think you are so lucky on how fast your quilts sell too. You are an amazing person! Scrappy quilts are my favorite kind of quilts. They are so energetic and alive! What a great idea, it looks fabulous! I love this quilt. It is a very fun quilt. I would love to make one with my scraps. What size are your blocks?